In Pleasure Driving the seat should be rather high, so that one may easily see over the dash-board of the carriage, but low enough for a direct pull on the bit when it is necessary. The feet should be firmly planted (avoiding an ungraceful or studied attitude,) in such a manner as to give strength to the pull, and security to the position, in case of a sudden jolt of the carriage. The legs and hips should be as firm and immovable, and the upper part of the body should be free and flexible, as possible, the principle being borne in mind, as in the ease of riding on horse-back, that while the seat should be perfectly secure, the security should not imply the least support from the reins, nor the least inability to do whatever may be necessary with the head or arms. The eyes of the driver should be always on his horses, yet always about him. While he should see every strap and buckle within eye-shot, every movement of the horses’ ears, every toss or shake of their heads, and every step that they take, he should also see every vehicle coming toward him, every object by the roadside, or elsewhere, which can possibly frighten his team, and every stone or uneven place in the road on which they are likely to step, or which may come in the way of the wheels. 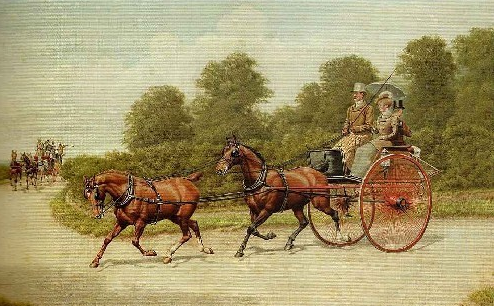 To sit in this manner, and to be thus watchful while driving a pair of lively horses, and at the same time to appear perfectly at ease, is no small accomplishment; still it may be attained by practice, and is essential to elegance in driving. Driving a single horse is not at all difficult, and it requires only a good hand, a good temper, and a watchful eye. The horse’s mouth should be ligthly felt, that he may be supported if he trip; and especially in going down hill, the driver should sit with his feet well braced and his hand ready to support the horse in a false step, which, if at all, is most likely to occur at this time. Driving a pair of horses requires much more skill and care. It is thus described by Stonehenge: “In Driving a Pair, the great art consists in putting them together so as to draw equally, and to step together. To do this well, the horses must match in action and temper, two slugs being much better than a free-tempered horse with a slug; because, in this case, the whip applied to the one only makes the other more free, and as a consequence it is impossible to make them draw equally. In some cases where two horses are exactly equally matched, the coupling-reins must both be of equal length; but this is seldom the case; and when they do not do an equal amount of work, the coupling-rein of the free one must be taken up, and that of the idle horse let out. In watching the working of the two horses the pole-pieces should always be the guide; and if both are slack, with the end of the pole steady, and neither horse shouldering it, the driver may rest contented that his horses are each doing their share; if, however, the pole is shouldered by either, that horse is a rogue, and is making the other do more than his share, keeping the pole straight by the pressure of his shoulder, instead of pulling at the traces. On the other hand, if either horse is pulling away from the pole, and straining at the pole-piece, he is doing more than his share, and his coupling-rein must be taken in accordingly. Sometimes both shoulder the pole, or spread from it, which are equally unsightly habits, and may generally be cured by an alteration of the coupling- reins of both horses, letting them out for shouldering, and taking them in for its opposite bad habit. With respect to coupling four-horse teams, the heads, particularly those of the wheel-horses, should not be too closely confined. It looks well to see them with their heads close together running boldly up to their bits; but if you confine them too tightly, they cannot apply all their power to the collar. Wheel-horses should, in this respect, have more liberty than their leaders, not only on account of the pole, but to enable them to “quarter their ground” and bring them into a proper situation to hold back in going down hill, which they cannot do if their heads are confined. When the leaders’ heads are well together, they are much easier driven; the least motion of the wrist will affect their mouths, and of course they are much safer on their feet; for, on the least false step they make, the support of the coupling-rein is immediately felt; without this, they would be down before they could receive assistance from the coachman’s hand. Of the two reins used for coupling, one must be upper-most at the crossing ; that one should be buckled to the horse that carries his head highest, otherwise he will be constantly annoying his partner’s mouth. All attempts at directions for curbing coach-horses must be vain, and can only be regulated by their mouth, temper and disposition.